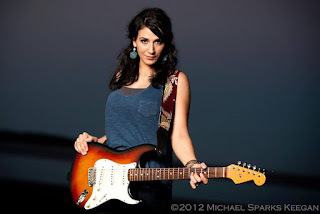 BLACK BOX Blues presents singer/songwriter/guitarist Sonya Rae Taylor on Saturday, March 31 at 8 p.m. at THE BLACK BOX theater, music, and event venue in downtown Franklin. Part of the new breed of blues and soul musicians, Sonya Rae Taylor is always searching for new ways to revitalize the form. A triple threat, Sonya is a fiery guitar slinger, soulful blues belter, and a songwriter of depth and craft beyond her years. Joined by her husband, Ryan Taylor, the powerful guitar duo has logged many miles in their young careers, from Boston to Austin then Nashville, where Sonya was signed by BMG Chrysalis. The couple has made TV appearances on shows such as the ABC series, Nashville, and has worked with or shared the stage with artists ranging from Tameca Jones, Gary Clark, Jr., John Popper of Blues Traveler, John Medeski, and Derrico Watson of the Victor Wooten Band. Tickets are $20. A cash bar is available. For tickets and more information, visit www.THEBLACKBOXonline.com or call (508) 528-3370. The home of the Franklin Performing Arts Company, THE BLACK BOX is located at 15 West Central Street.